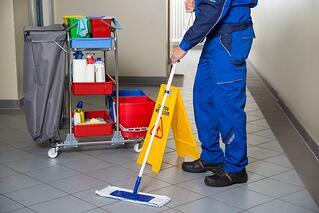 Is Day Cleaning Right For Your Facility? Day Cleaning, After Hours Cleaning Or Both? More often than not, commercial cleaning companies and their cleaning teams enter your building when the workday has finished. It can certainly be easier to vacuum, empty trashes and clean restrooms when most of the employees and visitors are gone from the building. And yet, some facilities find that they have a need during the workday for cleaning or they are looking for ways to cut costs on electricity or security concerns by moving cleaning services to the day time. There are many reasons to have cleaning staff available during the day. Day time cleaning may not the solution for a building running around the clock, but it is often a logical step for facilities that follow a customary business schedule. There are also good reasons to keep cleaning relegated to after hours. Some Facility Managers have a preference for one and some facilities find they like using both, a Day Porter or day time cleaning crew for keeping up with your needs throughout the workday and an after hours cleaning team to tackle those cleaning tasks not easily completed during work hours. If your facility has consistently used an after hours commercial cleaning service, the transition to day cleaning can be challenging. There isn’t one single way to utilize a day cleaning service or day porter and there isn’t just one way to transition. Coordinating services with your building’s occupants presents its own hurdles. Likewise, getting occupants used to new people moving throughout their space during the workday is different. Adn it should be noted that finding office cleaners or a cleaning team that can work effectively during the day, intermingling with your employees requires a different ‘fit’ than nighttime cleaners. Some night cleaners would work equally well among your tenants and others not so much. If you desire to transition to daytime cleaning services or a day porter service, your janitorial services company will have to do the work to assure the cleaner or cleaning team is a good fit for your facility. Can Day Cleaning Cut Energy Costs? Day cleaning can be the more sustainable alternative because with no one in the building after hours, you are not paying to light your entire facility. While there is typically energy cost savings of on average of 6%, it isn’t often easy to determine exact energy conversion costs. Not only can your building benefit from significant energy cost savings by switching to a day porter or day cleaning team, but often, the level of the perception of the overall quality of your janitorial services goes up. Why is this? In part because with cleaning staff available during the day, there is better communication and responsiveness. No matter how adept your night time janitorial services are about following the cleaning spec, they just cannot respond in real time to requests and needs the way a janitor, custodian or office cleaner who is there when you are can. Making a day cleaning schedule for you, your facility and your occupants requires a bit of planning and finesse. Ideally, if you have an effective, professional, experience Detroit janitorial services company, they can help you transition smoothly and effectively meet the unique needs in your building or buildings. Transitioning from night cleaning to day cleaning takes more than simply shifting your cleaning crew’s schedules, it takes looking at what cleaning is needed in your facility and when it can best be done to minimize unnecessary interruptions in the workday. Additionally, some cleaning methods are better than others for daytime cleaning and this is a factor your commercial cleaning company should be well aware of. You and you janitorial contractor will have to take into consideration whether there are areas off limits to cleaning staff during certain hours because of noise restrictions and optimal times to clean restrooms so as to disrupt normal building patterns as little as possible. And part of setting your day cleaning up for success is communicating changes to occupants and setting up a consistent schedule that helps your building’s occupants adapt to the daytime cleaning. Understanding the flow of your facility can go a along way in optimizing how day cleaning works for you. And when you begin to implement a new program, keep your building’s occupants in the loop with reminders and opportunities for feedback. Quiet vacuums are a must for day cleaning and are remarkably effective at keeping noise down to an acceptable level, but more disruptive tasks can be pushed to times that are least problematic. And with more traffic throughout your building while cleaning is taking place, your janitorial company must be diligent about safety through care with cords and obstacles and consistent use of signage on wet flooring. On that same note, the products your cleaning company uses during day cleaning are even more critical as your employees are around. This means sticking to environmentally safe cleaning products is a must. Some janitorial companies even utilize a daytime shift that ends an hour after business hours thereby saving on energy, making building security easier while also leaving room for noisier, more disruptive tasks at the very end of the day. And it is wise to check in with tenant and cleaners after the implementation of a day cleaning program to see where it is working and where it might not be. This way you can catch issues before they become full blown problems. Day cleaning can be a good alternative for many facilities but it isn’t without its issues. Yet if you work with a professional, reputable, experienced janitorial contractor, you can make day time cleaning work for you.